If you’re reading this blog post, I suspect you’re interested in getting found online. Most commercial real estate firms will get a website to help with their online rankings, but what if you haven’t yet created your website? This blog post will tell you how to get found on Google without a website. For those who do have a website, keep reading because these tips can also help you increase your Google rankings. So, what’s the trick to boosting your rankings? The answer is to claim and optimize your Google My Business (GMB) page! GMB is a free resource used to list your business on Google. If the listing is completely filled out, the business phone number, website and button for directions will all show up for the business, in a Google search. A GMB listing can also show the company address, hours of operation, relevant photos, Google ratings and reviews submitted by Google users. Chances are, you’ve seen these types of GMB listings on Google before. If you search for a restaurant, search for church or search for some other type of local business, you will likely see some GMB results. The key for any commercial real estate marketing professional is to make sure to get the GMB listing claimed and optimized for their brokerage. If you want to create a GMB listing for your commercial real estate firm, the first thing you’ll need to do is go to the Google My Business website. Once you’re there, just follow the prompts for claiming and verifying the authenticity of your business. It’s a pretty simple process and the video below will visually show you how to claim your listing. NAP is an acronym for Name, Address and Phone number. When you create your listing on GMB, you will provide your company name, address and phone number. That’s valuable information, but Google likes to know how relevant that information is. So, as Google scans all the content on the internet, it’s continually searching for any references to your NAP, to confirm that you really are who you say you are and to determine how relevant you are. The more you stay consistent with your NAP, the better it will be for your GMB rankings. Not only do you want to remain consistent with your NAP, but you should also strive to share your NAP across the web. By doing this, Google will have more opportunity to find and verify your relevance. Listing your information on your website is good, but you should also consider adding your info to various directories. These directories could include TheBrokerList, LoopNet, your local chamber of commerce, social media accounts, etc. When you setup your account, you’ll have the option to select a category for your business. In your case, you’ll probably want to select the category of “Commercial Real Estate Agency.” You are able to select more than one category, so if it makes sense to also select “Commercial Agent,” go ahead and do so. See if there are any other categories that may be relevant to you, such as a category along the lines of property management, office space rental agency or something else that may be applicable to you. The better you can categorize your firm, the better Google will understand you. Interior: Showing pictures of your reception area, offices, meeting room and whatever else your brokerage has in the interior category. Exterior: Take a few pictures of the exterior of your pretty office building. At Work: Did you close some deals and have pictures of your sold or leased listings? Slap “SOLD” across the image and upload it. This would be a great way to show off the work you’ve done. Team: This is an easy one. Take the profile picture for each person in your office and add it to this category. If you can, take a group picture and add that as well. Identity: Add any identity images to this section. Such as a your signage on the front of the building, with the name of your office. Photo Tip: You probably have a specific image you’d like to always show up when people view your GMB page. Most businesses do. However, please keep in mind that Google doesn’t let you actually select what image shows up when someone searches you. Google selects the image it wants to show, based on an algorithm it uses to determine the best and most relevant image. You can’t really go in and tell Google what image needs to show up first. So, if you get all your images added and it’s showing an image that’s not your favorite, try not to get all worked up about it. If there’s a certain image you really do like, and you want it to show up first, you can try to make it show up more favorably in the algorithm Google uses. But there aren’t any guarantees that it’ll work. And even if it does, it may take more time than is really worth the effort. Do ask your clients for reviews. Do you know someone you’ve worked with who would be willing to write a review for you? If so, give them a call and ask them to write a review. Do educate and help your client. Tell your client that you learned Google reviews can increase your rankings on Google and offer to write a review for your client as well. You scratch their back and they scratch yours. Why not offer to help? Don’t ask people to submit reviews on the same device. Let’s say you have a computer at the office. You meet with your client and ask them if they’d write a review for you. They say they would be happy to and you offer to let them sign in on your computer and walk them through the process. That’s nice of you, but Google doesn’t like to see multiple reviews coming in from one IP address. It will see the same computer is being used over and over again, and this will look bad to Google. For all Google knows, you’re creating multiple Google accounts and then logging in and making a bunch of great reviews from fake people. Don’t risk getting your GMB account penalized or suspended. It’s not worth it. Do ask the brokers in your firm to help solicit reviews. The more participation you can get the better. In fact, I know one commercial firm that would run Google review contests and the two brokers with the most reviews received gift cards. It’s definitely possible to get found on Google without a website. And if you do have a website, even better! Just make sure you claim your listing, get your listing as optimized as possible and then sit back and take a look at the stats. You will be able to see, in your GMB Insights, the number of people who click to get driving directions, visit your website or make a phone call because of your GMB listing. There are other stats as well that will help confirm the value you receive from having a well optimized GMB listing. Now it’s up to you. I wish you the best of luck with your listing. And please don’t hesitate to contact us if there is anything we can do to help you with your online marketing! I work with many commercial real estate brokers and have had a few brokers ask me how much revenue is actually generated from having a website. It’s impossible to give one answer that applies to every commercial broker, but I can present a formula that will help you answer that question for yourself, and give a general answer that should be applicable for the average commercial broker. The rest of this blog post will address the various aspects that impact how much revenue you receive from your website. How many website visits does it take to get a good lead? Robert Andolina published an article about converting real estate website traffic into leads. In that article he said “Some recent studies [August, 2013] have shown agent’s websites that generate large volumes of traffic have only about a 2% – 4% conversion rate.” He defines a conversion as a “hot lead.” The rest of his article talks about how you can increase your conversion rate. How many good leads per closing? Now that we know how many website visits result in a lead, the logical next step is to determine how many leads will result in a closing. There are several articles and opinions on the average number of leads per closing for commercial real estate. The numbers typically range from 1-5%. It really depends on the quality of the leads and your skill in closing a deal. If you get 100 leads, and you close 1-5% of them, you will get 1-5 closings. I think 3% sounds like a good average number. That’s what I’ll use for my calculations in the last table of this blog post. What’s the value of a closed deal? For the commercial real estate industry, the actual transaction value can vary to a large extent, depending on the commission rate and the transaction value. If you specialize in one specific property type, you may need to adjust your commission rate accordingly. However, based on LoopNet forums and other reports, it seems safe to say the average commission rate is around 4%. This is just an average number for us to work with, but it seems very realistic. For your convenience, I also put together a table (below) that shows adjusted transaction values and adjusted commission rates. This may be helpful as you do your own calculations. How much is your CRE website traffic worth? Now that we have these estimated figures, we can calculate the actual value of your website traffic. I suggest you check and see how many website visits you are getting. Then, use the table below to see the estimated amount of revenue you are generating because of those website visits. As an example, let’s use the seventh row down. This is for the person who generates 15,000 website visits. In their case, their website will likely result in around 450 good leads, 14 closings and a total of $108,000 in revenue. First, get your numbers together. What percentage of those visits turn into a lead? ________ Most real estate professionals report a 1-5% conversion rate. 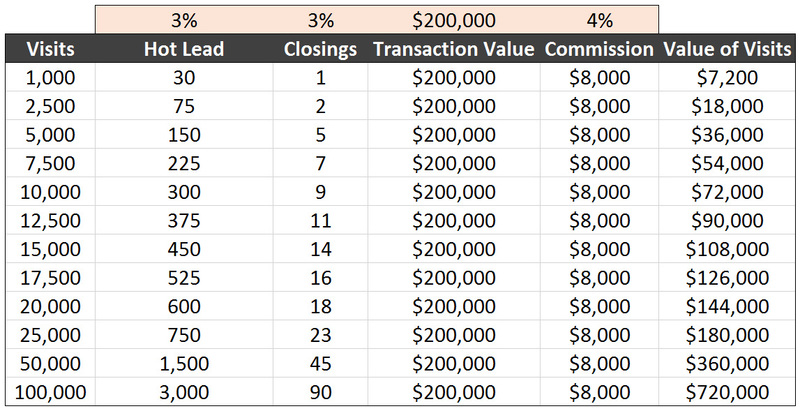 What percentage of those leads will turn into a closing? _______ Most real estate professionals report a 1-5% conversion rate. Second, run these calculations, with your numbers. Multiply your visits by your leads percentage (example: 15,000 x .03 = 450). This gives you your leads. 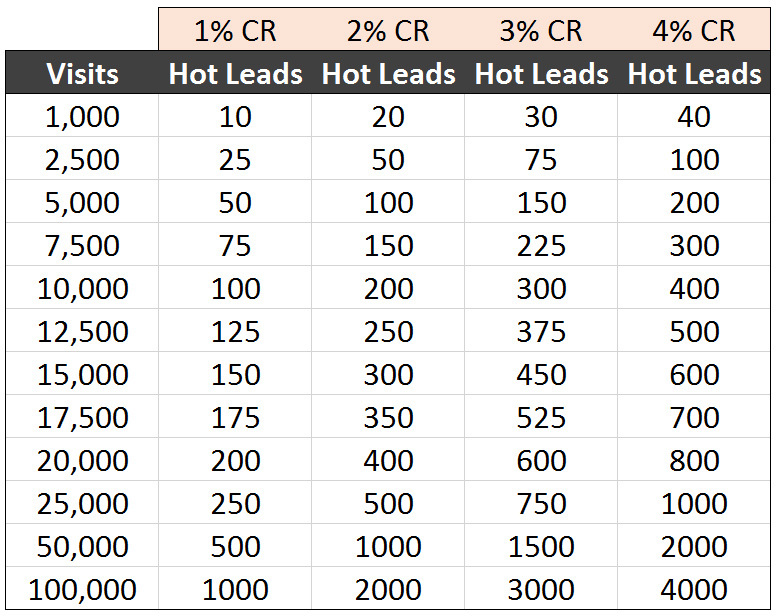 Multiply your leads by your closing percentage (example: 450 x .03 = 14). This gives you your closings. 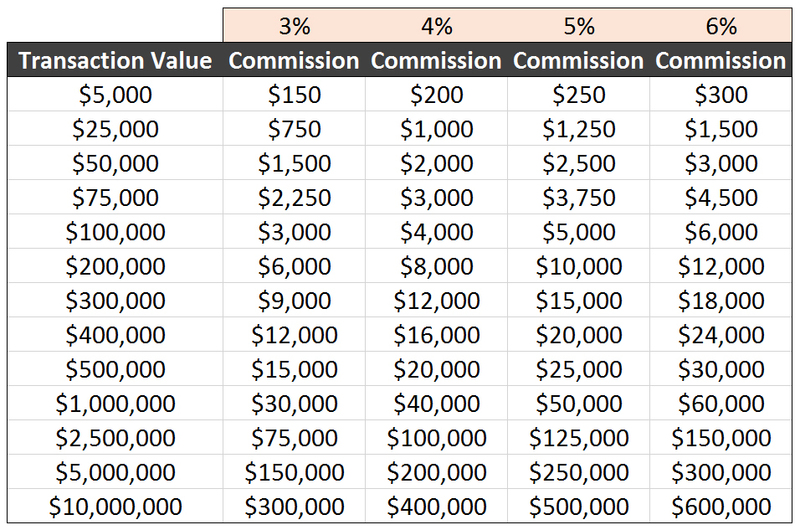 Multiply your average transaction value by your commission rate (example: $200,000 x .04 = $8,000). This gives you your commission. Tada! This tells you how much revenue you were able to generate, based on the amount of website traffic you received. Please realize these numbers are based on the best statistics I could find, for the commercial real estate industry. Most of the data is based off of qualitative surveys, rather than quantitative research. Of course, you may have different results, based on your unique situation. This blog post isn’t designed to be a statistically absolute calculation of what you will make from your website traffic. There are many factors that could impact your results. Having said that, it’s quite likely your results are even better than what I presented above. This is especially true if you have a higher average transaction value or a higher commission rate. However, I believe this is a very good generalization of what the average commercial real estate broker can estimate. In the end, it all depends on you, your website and your market. Now, see what you can do to increase your website traffic and conversion rates. The higher these numbers go, the more revenue you will make. If you want help boosting your website traffic and leads, I’d be happy to have a conversation with you. Just let me know! This blog post is going to tell you why you should be blogging… if you aren’t already. I’m telling you, if you aren’t blogging, you’re missing out! But before I tell you why you should blog, I first need to tell you about Google. So, here we go!